Francisco de Goya, Que pico de Oro!, Plate 53 from “Los Caprichos”, 1799, Art Gallery of Ontario, Gift of Joey and Toby Tanenbaum, 1999. 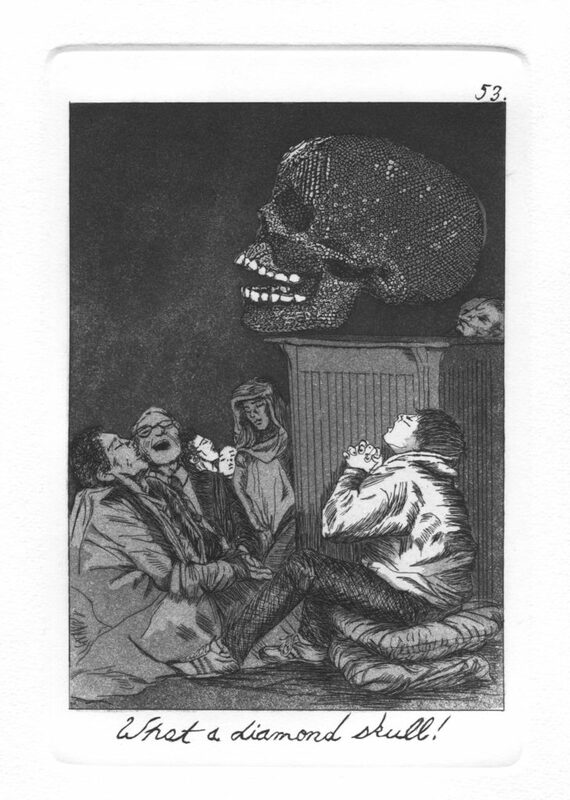 The Caprichos by Emily Lombardo is a series of etchings which are in direct conversation and homage to Francisco Goya’s Los Caprichos, 1799. Both explore and present a satirical critique of contemporary culture and the forces that influence society along economic, racial, political, religious, and gender lines. Born in rural Aragón, Spain, in 1746 and educated in Zaragoza, Francisco Goya was exposed to a professional artistic milieu from an early age through his father, a gilder. After studying for a few years under Luzán in Zaragoza, Goya moved to Madrid to work under Francisco Bayeu. In Madrid Goya enhanced his position at court and ingratiated himself with the wealthy and the powerful through numerous commissioned works. A series of impressive tapestry cartoons and portraits of influential members of the court resulted in his appointment as Court Painter to King Carlos IV in 1789. Goya’s art is remarkable in that his whole style and approach to painting changed in his mature years after he contracted a mystery illness in 1792. The type of illness remains uncertain, but resulted in the complete loss of his hearing. It took Goya some time to return fully to his art and during the recuperation period, divested of his commissioned workload, he experimented greatly in style. During the 1790s, Goya created a series of drawings called Sueños (Dreams) that he originally planned to publish under the title Universal Language, which prepare the way for Los Caprichos of 1799. Goya’s attention was drawn, as Juliet Wilson-Bareau writes, to a widening range of “social and religious evils more directly: the lures, abuses and deceptions of arranged marriages; prostitution and social philandering; the greed and self-interest of monks who live off their fellow men; the asinine incompetence of doctors; and the pretensions of the aristocratic elite.” His style and subject matter became darker as he explored the world of religious superstition, witchcraft, the Inquisition, and the outmoded traditions of Spanish society. All of the works emanate from the mind of “the author dreaming,” and form a dark catalogue of the artist’s imagination in the wake of his confrontation with deafness and serious illness. 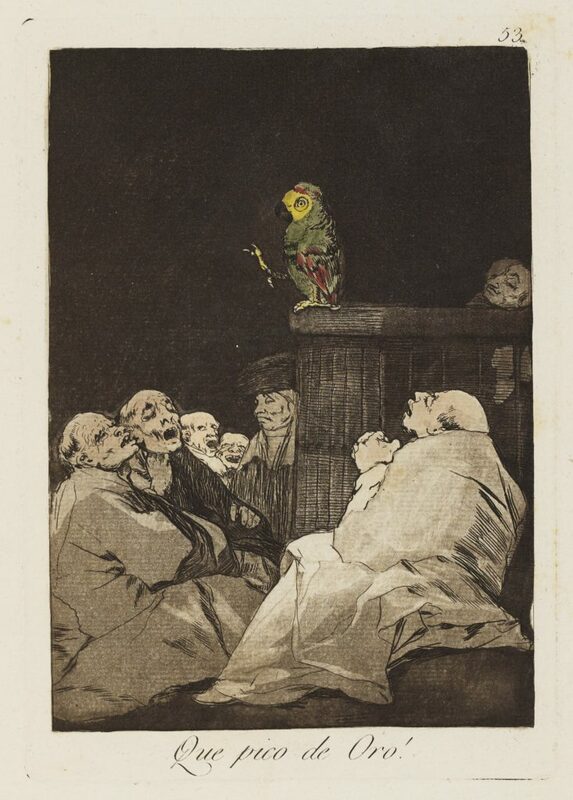 A series of prints of whimsical subjects invented and etched by Don Francisco Goya. The artist, persuaded that the censure of human errors and vices—though it seems to belong properly to oratory and poetry—may also be the object of painting, has chosen as appropriate subjects for his work, among the multitude of extravagances and follies which are common throughout civilized society, and among vulgar prejudices and frauds rooted in custom, ignorance, or interest, those which he has believed to be most apt to provide an occasion for ridicule and at the same time to exercise his imagination. It closes with the address where the prints can be bought—the No. 1 Calle del Desengaño, or Street of Disillusion #1—and the price: 320 reales for the set, the equivalent of one ounce of gold. The unusual venue, a perfume and liquor store near Goya’s apartment, was the result of the artist not being able to find a regular bookshop to handle the sale, according to Goya biographer Robert Hughes. The venture was a resounding failure. Only 27 sets of the edition of 300 sold, and Goya withdrew Los Caprichos from public sale shortly after their release. It was a substantial monetary loss for the artist. 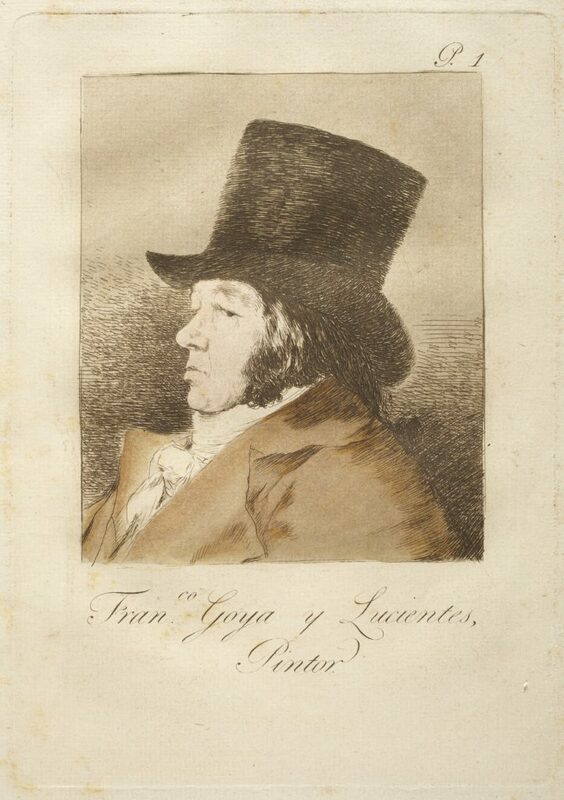 Several of the first editions were hand-colored by collectors, though likely without Goya’s approval. The “series of prints of whimsical subjects” changed everything. As Robert Flynn Johnson wrote, “Los Caprichos stands as the greatest single work of art created in Spain since the writings of Cervantes and the paintings of Velázquez, over one hundred fifty years earlier. These astonishing prints have cast a dark shadow of inspiration over generations of artists since their creation. Eugene Delacroix owned a copy of all eighty plates, and their influence is evident in the socially conscious art of Honoré Daumier and Edouard Manet, among others.” And the impact continues to this day. Emily Lombardo (1977) is an American artist who has lived and worked in Boston for over fifteen years and currently resides in Brooklyn, New York. She received a BFA from The Massachusetts College of Art and Design, Boston (2002) and an MFA from Tufts University (2013). Her work is in the collection of the Museum of Fine Arts in Boston, The Boston Public Library, the Mead Art Museum at Amherst College and the Academy Art Museum, Easton, Maryland. She has taught printmaking since 2011 and has won numerous awards. Lombardo applies her knowledge of sculpture and print across a wide range of conceptual projects. She engages with appropriative art practices as a mode of investigating personal and cultural identity and makes conceptual, personalized work that investigates archetypes of cultural identity. The Academy Art Museum recently acquired Lombardo’s The Caprichos series for its Permanent Collection. The edition was published by Childs Gallery in Boston and printed at The Center for Contemporary Printmaking (Norwalk, Connecticut) by printer Paul DeRuvo. The Museum acquired the eighth set in the original edition of twelve. Whereas Goya’s etchings addressed Spanish economic, political, and religious troubles during the Age of Enlightenment, Lombardo’s eighty prints highlight contemporary social issues through a feminist lens. Using Goya’s work as a point of departure, Lombardo showcases recognizable figures and events—including Miley Cyrus’s act at the 2013 MTV Video Music Awards (plate 6), Marina Abramovic’s performance The Artist is Present (2010) (plate 26), and Damien Hirst’s diamond skull artworks (plate 53)—to critique the art market, international politics, gender roles, and societal expectations. In plate 52, What a Tailor Can Do! , the political duplicity of using the Space Race as a means to forward the Cold War is depicted. While the nation rallied behind the mission to the moon, government spending was channeled to missile development and the war in Vietnam. The scene exposes the Space Race as an arms race, while also displaying both the populace’s ignorance of and complacency in the situation. Lombardo has said that she views appropriation “as a mode of investigating personal and cultural identity, placing marginalized identities in the center or skewing that axis,” and as a central element of the artist-apprenticeship tradition. The use of recognizable politicians, celebrities, events, and institutions make The Caprichos instantly accessible to present-day audiences. The artist states her belief that “self” is produced through of a series of assimilations and rejections of the attributes of others. Therefore, via a complex cultural diet of consumerism, upbringing and educational guidance and the web of social signifiers, a self is formed. Her work seeks to pull back what she calls the “foggy membrane of collective and individual history” to construct narratives about the “other” and how we are located in cultural space. 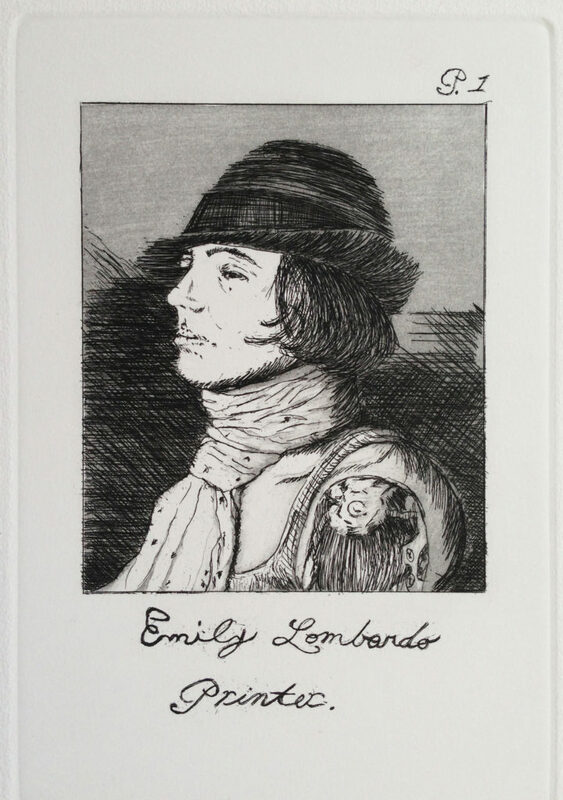 Emily Lombardo continues her printmaking through historical research and is currently preparing a series of prints based on the lively but tragic diaries of a nun living in Renaissance Italy. To listen in on an interview of Emily Lombardo click HERE. View an Excerpt from Exhibition Catalogue HERE. We express our deep gratitude to the Art Gallery of Ontario in Toronto for graciously lending a rare first edition of Los Caprichos by Francisco Goya (1746–1828). This set of hand-colored prints, originally mounted into a nineteenth-century album, was a gift of Joey and Toby Tanenbaum to the Canadian museum. We are proud to offer Emily Lombardo her first solo museum exhibition, and our inaugural Artist-in-Residency, made possible through the generous support of an anonymous donor. The purchase of the Museum’s complete set of Lombardo’s Caprichos was made possible by contributions from the Collection Society and with support from Tom and Alexa Seip. Special thanks to Childs Gallery, Boston, for financial support of the exhibition and catalogue. Artist Talk with Emily Lombardo: November 30, 2017 from 4:30 - 5:30 p.m.